Turning Point Church welcome's you. Roll cursor over each picture to reveal verse. Why Scripture memory is important. Memorize the verse always saying it in this order: TOPIC, REFERENCE, VERSE, REFERENCE. (Saying the reference twice is important since the numbers are harder to remember for most people). Memorize the verse early in the week (so you can say it without hesitation). Then review it at least once a day for the rest of the week. Can you name all the books of the Bible? A few minutes with these pictures and you'll know them all! 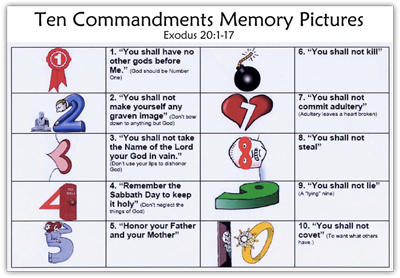 Ten Commandments Memory Picture available — click small image below. If you're part of the Turning Point Church family - CLICK HERE.